Another confusing week from the show runners at Doctor who; the Doctor and Clara investigate a haunting in the 70’s. I’m not exactly sure what I watched. I desperately want to like this new companion, especially because she seemed so promising both in 7.01 and the Christmas Special, but the longer she is around, the more I am worried that Moffat and Co. Have done a stellar job of making her incredibly boring. There are a few redeeming features though, particularly her relationship with the TARDIS. Matt Smith in the mean time is continuing to be a truly wonderful Doctor. It’s a shame that the episodes have lacked so much during his run. It’s a credit to him as an actor and his portrayal of the Doctor that he continues to be so entertaining. 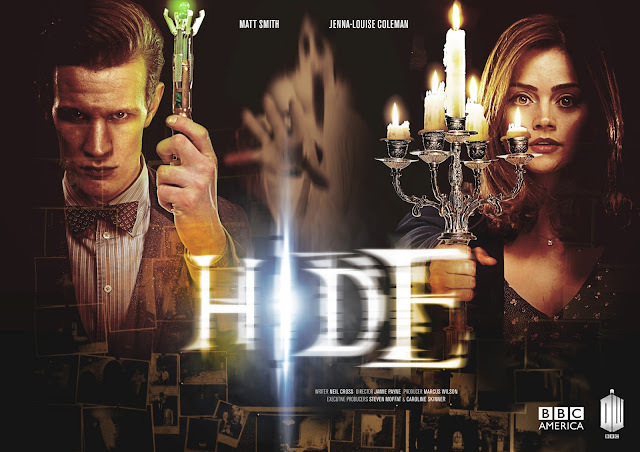 So what happened in the moderately spooky ‘Hide’? More under the jump. Well the plot was a mess... again. The Doctor and Clara arrive at a house to investigate a duo who are investigating a ghost. There’s obviously something else at play here but the horror film type build up is genuinely spooky, as the Doctor and Clara investigate the house and feel they are being watched. Of course it’s all a lot more complicated than a silly little ghost. The houses’ resident empath Emma is being used by her nerdy lover (well soon to be lover) Alec to communicate with the spirit. The two can’t seem to discuss their own feelings however, which Clara says are obvious... maybe to just Clara because the chemistry between the guest actors is non-existent. They smack on the overacting towards the end, and I didn’t care about their relationship at all. So the ghost it seems is actually just a woman from the future, stuck in a pocket universe, her image bleeding through into the real world where years are mere seconds to her. Confusing? Well, more confusing is the contraption the Doctor uses to get into the pocket, using the power of the empath (WTF). Let’s briefly focus on a couple of cool things here. Matt Smith, with a long swishy coat running around a misty forest was fantastic, more of that please. His fear, his desperation, it was one of the better parts of the episode. He finds the trapped woman, sends her back first and gets stuck behind in the pocket universe. Clara tries to convince the TARDIS to follow him into the pocket universe, risking destruction. This is the other cool bit. I really like that Clara and the TARDIS, for whatever reason, do not get along. For so long now the TARDIS has had a special bond with the Companions that the Doctor has brought on board, to have her actively dislike Clara, disappearing parts of herself, locking the doors, mocking Clara with a hologram of herself is genius and reminds me of Neil Gaiman’s episode and the TARDIS Idris manifestation. Clara banging at the doors and calling the TARDIS a cow is hysterical. Of course, the TARDIS lets her in and they go to the pocket universe to rescue the Doctor, that’s one thing they can agree on. It seems that any spark between the Doctor and Clara has been extinguished and like Amy, their friendship doesn’t always read as legitimate. The moment that they high-five in this episode is one of the rare moments where we can glimpse a friendship forming. Good aside, the end of this episode is utterly atrocious. Not enough that they have solved a puzzle, cheated death and get to go on their merry way, now comes the tale of the many endings. Before the Doctor and Clara leave, there is a reveal that the lady trapped in the house is actually a descendant of the empath and the nerdy ex military guy. Wow. What did that contribute Moffat? Zero. Aside from it seeming stupid. The Doctor then comes clean that he was actually never interested in the ghost and more in Emma’s empathic abilities shedding some light on Clara. Boo. How would she even know anything about anything? Oh... and by the way, another ending, the creature, it was actually trying to get back to its mate... LOVE don’t you know, it’s actually a love story... what? This is messily followed up with a confusing sequence of the Doctor going back to retrieve the other creature from the pocket universe, abruptly ending mid-adventure. It lacked the heart it was so desperately trying to cultivate. Yes. Let me reiterate, I am not sure what I just watched. It saddens me that the stories in the second half of this season have been so strange and messy... and boring. Next week’s Journey to the Centre of the TARDIS looks like it might be interesting and fun. I guess we’ll see. The beginning of this season started quite strong, it’d be a shame to see it continue into mediocrity. If he is not married, raise him out for a run. If he's married, think about him until he breaks down, borne him, than ruin his life. Thanks, Kevin Smith. I enjoyed this comment more than all of your recent films.